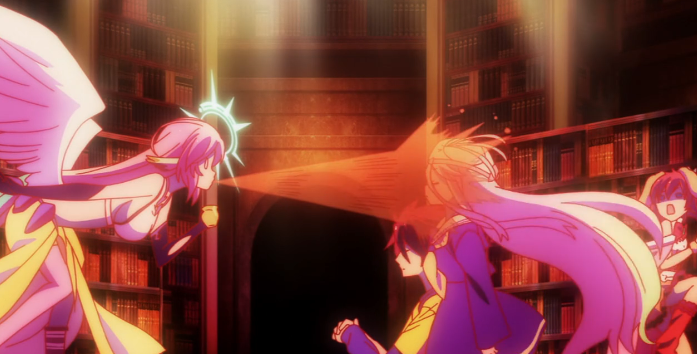 No Game No Life episode 6 is about Blank gaining the use of the library to help them learn about this new world. So they have to challenge the flugel who currently owns it. Jibril says that the game will be materialization word chain. The point is to make it so that the other person can no longer answer. After the game is over everything will go back to normal. So Sora kills off Jibril in the game, so she could not answer. Then he has access to the library. 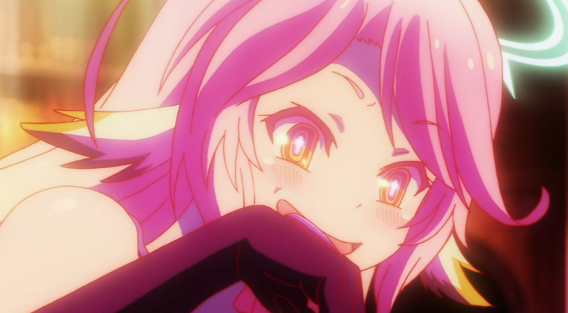 This episode of No Game No Life spent way too long on fanservice. This is a pivotal battle and yet there is time for more fanservice than most of the other episodes. It felt like this battle was not taken very seriously. If humanity only has their intelligence to rely on to win and they have no library how can they win? Hopefully this is not the direction this story is taking. I do not mind fanservice in the less important parts of the story, but important battles should be left alone. Also anyone who does not want to see what is basically a naked loli should avoid this episode. The way that Blank won the game does not even make sense. The two of them should have been screwed when they could not talk or at least should have had to write something down at the time. Instead Sora knows instinctively that Jibril will use that exact phrase when he needs her to and already has an answer. There should be no way that he could predict that. The game of materialization word chain was interesting despite the win being crazy. Since they are not supposed to directly kill the opponent I wonder how they usually end the game. Do they always indirectly kill the opponent? The winning was not the only crazy part of the show though. The group lives for several minutes with no air, oxygen, or atmosphere at points in time. They all should have died earlier than they did in the game. A teacher by trade, Pink Prinny is a lover of all types of manga and anime. She has a near encyclopedic knowledge of Shojo and wants to bring the truth about good and bad anime.